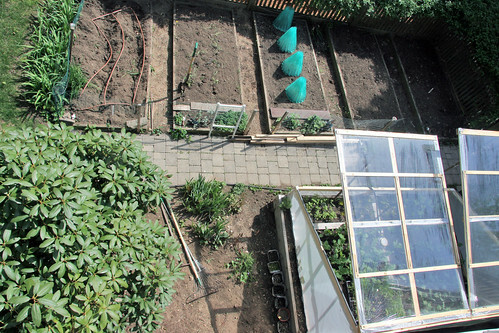 - Potatoes planted in far left bed: All Blue, Cobbler, Green Mountain and Butte Russet. I'll leave the irrigation line above the soil for now in this bed. Is your irrigation system like a soaker hose (millions of micron holes) or does it have drip emitters? You're garden is starting to take off! My irrigation system has little holes in solid tubing. I like it because it has lasted for nearly 10 years now. Soaker hoses need to be replaced yearly I think. I will add a label/link to info on the system. What great cold frames! Hope your greens are doing well.